At what point in the Christian life should you anticipate taming the sinful nature? How long should you expect to struggle with doing what’s right in God’s eyes? On today’s program, Ron Moore looks at that issue and offers an expiration-date for the “old-man’s” power in your life. What are the signs that our repentance is complete? What will we feel and how will we think? That’s Ron Moore’s focus on today’s program. Join him and rejoice in God’s healing renewal. You’ve sinned…perhaps greatly. Now, you want the joy of your salvation restored…but how? Ron Moore shares the key ingredients to finding renewed fellowship with God. How do we reconcile the Lord’s warning to “Judge not lest you be judged” with His command: “If anyone is caught in any trespass, you who are spiritual, restore such a one?” Ron Moore explores that sensitive issue through the life of King David. What are the steps we take when setting off on a journey into sin? And, once on our way, what trespassing side-trips will be necessary to insure our desired destination? Ron Moore looks at sin’s itinerary and the often ignored consequences that wait at journey’s end. It’s the attribute of God that banishes fear and invites us to enjoy Him forever. Absent it, we’re lost without hope. But, as Ron Moore is about to share, through this sole characteristic, today we can be found and kept safe for infinite tomorrows. Have you laid a dream to rest? A dream that occupied your heart and mind for years? One that inspired you and helped you face each day? Ron Moore talks about what’s next and the new dream that’s greater than the first. Worship is best offered with feeling. So what do your feelings toward God, and the expression of those emotions, say about the condition of your heart? On today’s program, Ron Moore answers that question. Listen for insight into your spiritual health. Do you desire to “turn the corner” in your walk with Jesus? If so, maybe you don’t know where to start. You feel held back by the past, or maybe you’re calloused by sin. Well, King David, the man after God’s own heart, experienced this very thing. In Ron Moore’s book “Worn out by Obedience” David is presented as a spiritual mentor. He’s both flawed and on fire. He’s the person you are and the person you want to be. In “Worn out by Obedience” you’ll discover how God often molds your heart, like King David’s, in seasons of brokenness, loneliness, and disappointment—sometimes even in your waywardness. 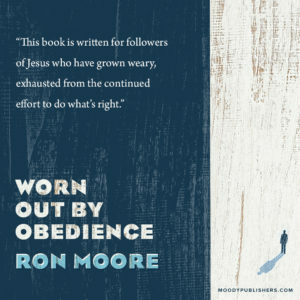 “Worn out by Obedience,” is published by Moody Press and can be yours for a donation of any amount.